(Middletown, CT) Chairman Rick Morin of the Middlesex County Chamber of Commerce, along with Event Chairman Rich Greco, announced that the 12th Annual Middletown Motorcycle Mania, presented by Hunter’s Ambulance, Hunter Limousines & the Hunter Family and driven by The Haymond Law Firm was held Aug 9 on Main Street in Middletown. 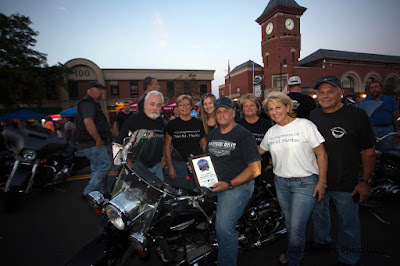 This annual event is in memory of Dan M. Hunter, a founding sponsor of Middletown Motorcycle Mania. More than 6,200 bikes and over 12,000 spectators filled the downtown Middletown area for what has become the largest one day summer motorcycle event in New England. Donna Hunter, Diane Hunter-Kranich and Dana Hunter-Moyer and Chairman of Middletown Motorcycle Mania Rich Greco pose with motorcyclist Charlie Warzecha of Essex, CT at the 12th Annual Middletown Motorcycle Mania. Warzecha’s 1966 Harley Davidson FLH was the winner of the Vern A. Hunter Vintage Bike Award, in Loving Memory of Vern and Barbara Hunter – presented by Hunter’s Ambulance and Hunter Limousines. De Kine Photo LLC.